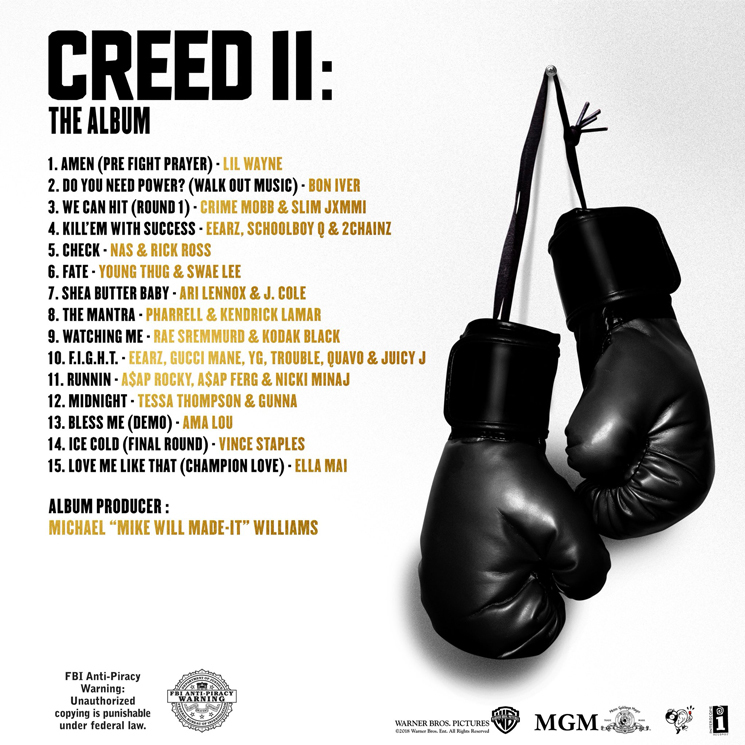 After learning of his plans to helm the Creed II soundtrack early last month, Mike WiLL Made-It has lifted the curtain on a star-studded tracklist for the effort. Fifteen tracks in length, Creed II: The Album features contributions from (in order of appearance) Lil Wayne, Bon Iver, Crim Mobb, Eearz, ScHoolboy Q, 2 Chainz, Nas, Rick Ross, Young Thug, Ari Lennox, J. Cole, Pharrell, Kendrick Lamar, Rae Sremmurd, Kodak Black, Gucci Mane, YG, Trouble, Quavo, Juicy J, A$AP Rocky, A$AP Ferg, Nicki Minaj, Tessa Thompson, Gunna, Ama Lou, Vince Staples and Ella Mai. As previously reported, Mike WiLL worked alongside composer Ludwig Göransson and music supervisors Fam Rothstein and Jen Malone on the film. Both Steven Caple Jr.'s Creed II and Mike WiLL Made-It's album arrive November 21. You can watch a trailer for the film here.